The show Portlandia has been in the news a lot lately (it will probably show up a few more times in Caffeinated PDX in the near future), and it would not surprise me if the show’s writers hung out at Albina Press while coming up with ideas for the show. Located a short walk north of the Mississippi district, Albina Press has a lot of Portland(ia) to offer you. If you were to go online and read through the reviews of the café, you would find that it gets a lot of love (and plenty of hate) for being the best (or the most pretentious) café in Portland. People seem to think the world of it or they seem to detest it. I don’t think you should believe too much of what you read on the internet (yes, I am aware of the irony of that statement) so I went to check it out for myself. As you might have imagined, it was cold and rainy when I went to visit the café and I was glad to get out of the rain and order some espresso. Albina Press seemed like a good coffee place. It smelled like coffee when you walked in (not all cafés do) and my espresso was solid. The online reviews, even the ones that skewer the café for being snobbish, tend to rave about the lattes and mochas that the baristas create. Speaking of the reviews, some of them claim that the baristas are conceited, but I didn’t find that to be the case. The barista who took my order seemed friendly enough and I didn’t see any sneers at the other customers either. After getting my espresso, I headed up to the back room. 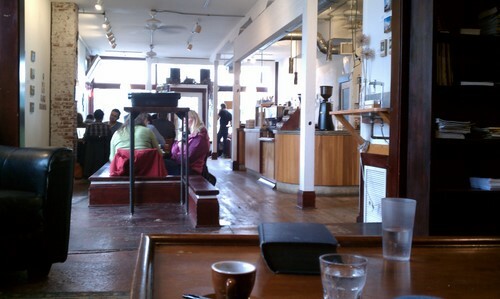 Albina Press is divided into two main areas. Out front, by the main door, there are lots of tables and a couch by the front windows. In the back there is a lounge room with a couple black leather couches and chairs. I sat down in one and was nearly swallowed whole by the cushions. Had I not been on a mission to observe the café, I probably would have fallen asleep. From my location, I had a pretty good view of the rest of the café. With its high, white ceilings and square wooden pillars that formed a line down the middle of the café, Albina Press reminded me of an old family grocery (maybe an A&P? ), built about a hundred years ago and later remodeled into a café. My favorite line of the Portlandia trailer is that Portland is a place “where young people go to retire”. On the couch next to me, a couple of these “retired young people” were sitting down close to one another, lost in a conversation of adoring glances and abbreviated sentences. They were enjoying the rainy day on the couch, reading magazines and taking it easy. In addition to the early retirees, there were plenty of hipsters around. 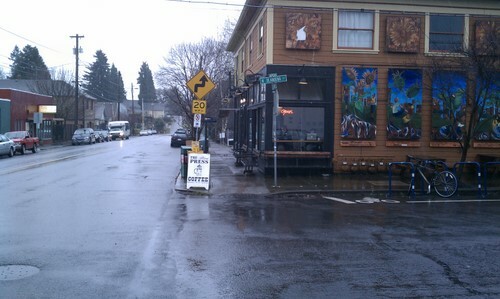 If you want to know what a hipster looks like, go sit at Albina Press for a while and watch people. I saw lots of hoodies, beanies, tight jeans (that were too short) and skateboarding shoes. The baristas were well-inked, with tattoos galore. Rumor has it that rock stars like to hang out at the café, but I can’t confirm this (of course, rock stars would have to be really famous for me to recognize them). Albina Press has Portland coffee (Stumptown) and is a place where lots of Portlanders like to hang out. If you are someone who likes Portland, or if you enjoy the caricature of the city that is Portlandia, you should definitely check out Albina Press. You won’t be disappointed.